A GREYHOUND bus driver battled through the pain of a broken arm after colliding with a cow to drop his passengers at a roadhouse before seeking medical help. The driver hit the animal 15km south of Daly Waters but turned the bus around and drove to a highway roadhouse. He was then transported more than 160km to Mataranka for medical treatment. The bus was travelling south when it struck the cow head-on the Stuart Highway at 10.30pm on Monday. The impact shattered the driver’s wrist, but the six passengers on-board escaped uninjured. He was treated at the Sunrise Health Clinic as the passengers waited for a replacement bus. An NT Police spokesman said the driver continued on despite his painful injury. “The cow smashed through the windscreen and hit the driver. It broke his wrist, there were no passengers injured,” he said. “The bus driver managed to drive the bus back to the highway roadhouse and the passengers stayed there and waited for a replacement. Wandering livestock have increasingly become a hazard to motorists this year. Recent statistics from the Department of Transport revealed six accidents where a car had struck a beast between Tennant Creek and Barrow Creek so far this year. A Queensland tourist spoke of his horror when he hit a cow on the Stuart Highway near Tennant Creek in August. Alan Cooney said he was travelling at 110km/h when he spotted the beast 80m in front of him in his headlights at 7pm. He veered left, but so did the cow. He hit the cow head-on but, fortunately, he and his wife escaped the crash with just cuts and bruises. Barkly MLA Gerry McCarthy told the NT News following the crash that the booming cattle industry was behind the surge in cows crossing the highway. 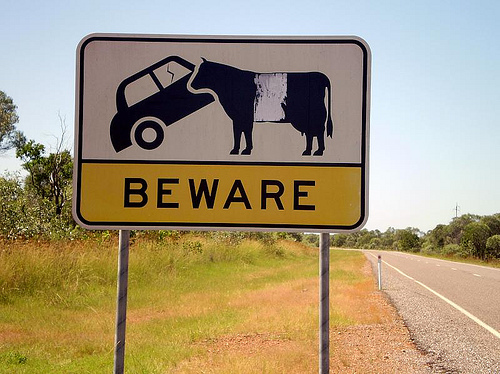 Territory Police have continually warned motorists to be wary of cattle when driving in the evening, early morning or night. Anyone who witnessed the crash should call Crime Stoppers on 1800 333 000.